It’s summary of post. Write about most interesting part of the post in excerpt so the visitors attract to it by just reading its excerpt. Excerpts are mostly used in content blocks and widgets to provide visitors an overall sight upon the post purpose. An excerpt can be auto generated by a WordPress theme or by using the <!--more--> tag inside the post content. 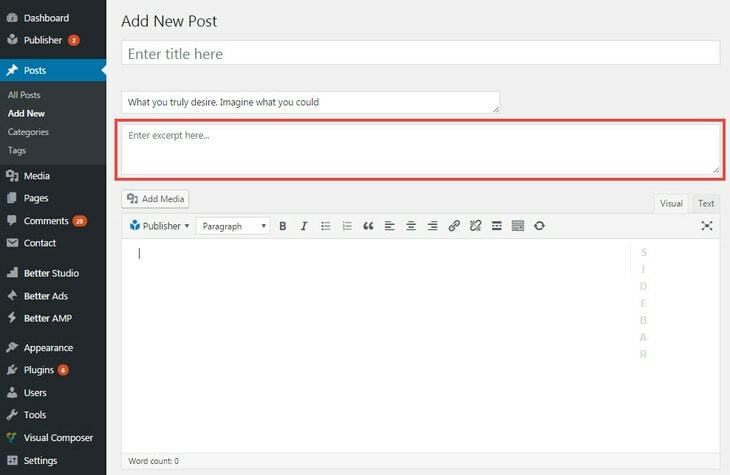 Creating excerpt by WordPress could be easier; click on Screen Options at top of post editing page and check Excerpt, but this field goes after post content nearly at the bottom of the page. But Publisher has an option to bring it up right before post content, so you never forget to write an awesome excerpt for your post. 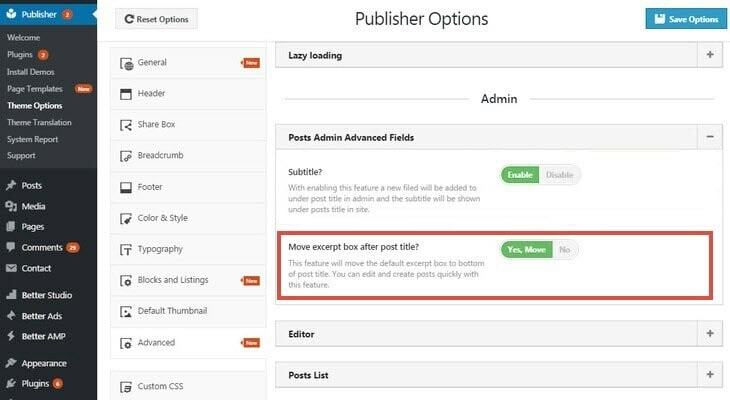 Go to Publisher → Theme Options → Advanced → Admin → Posts Admin Advanced Field. Here you can find Move excerpt box after post title? switch button, here you can choose to show excerpt field at top of post editing page. After enabling excerpt field in Publisher options, in post editing page you see its respective field right before post content. Write an excerpt for your post in above field. As mentioned above, excerpt is an summary of post content which represents the whole purpose of the post. It mostly used in homepage, content blocks, widgets, related posts and situations like these for attracting visitors. Most Publisher exclusive content blocks & widgets have an option to show/hide post excerpt. For more information read block settings.